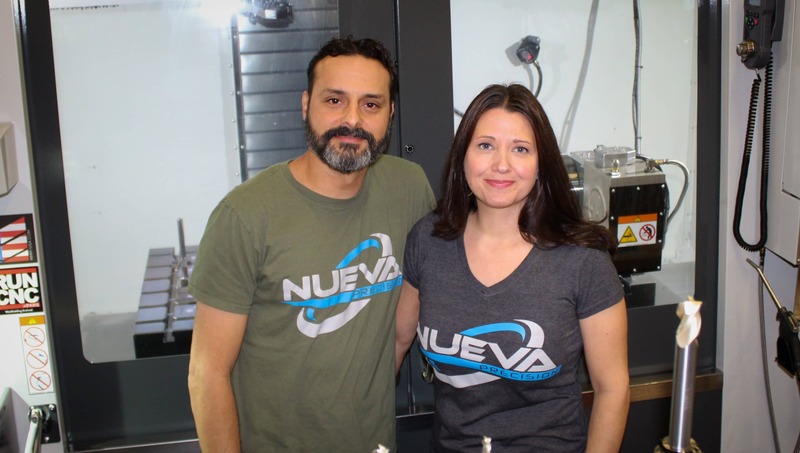 Okluma is a small manufacturing business located in Oklahoma City focused primarily on creating high-quality flashlights that can stand up to the most extreme conditions. 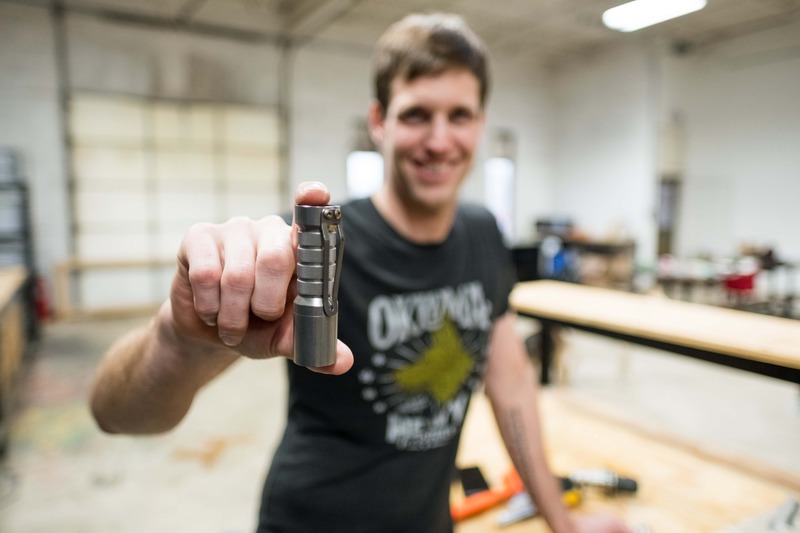 The company was founded in early 2015 out of owner Jeff Sapp’s garage, and has quickly gained a solid reputation as one of the best-built and most reliable flashlights on the market today. 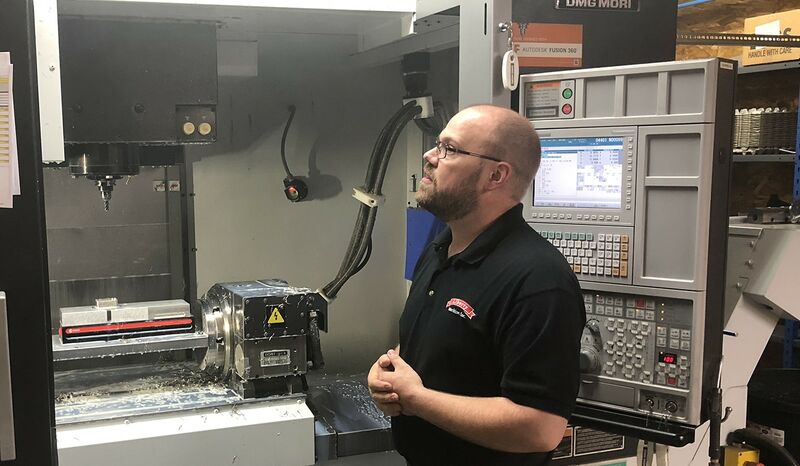 We were able to steal a few moments of Jeff’s time to interview him for this Featured Customer post, where he shared his thoughts on topics like the importance of customer service, the reason to use higher quality tooling, and his transition into the world of CNC machining. To get started, how did you first get involved in manufacturing? In high school I actually worked in a machine shop. This is where I got my first exposure to big machines and manufacturing. I worked at the shop until I graduated, doing simple things like sweeping the floor and running errands. The work wasn’t very exciting, but it did give me some really good exposure to the world of machining. Every now and then one of the machinists would let me help out with a part, but that would be rare. I did manage to save up enough money to buy a small mill and lathe, which I took with me when I went off to college. During college and after graduation, I made a living by writing software, which I did successfully for 15 years. Eventually I got tired of writing software after I had spent more than a decade in that space, and I wanted to try something new. I had picked up small jobs and worked on personal projects over the years, so I decided to enroll in a machine shop school in Oklahoma City to learn more about manufacturing and becoming a machinist, and graduated from there with a renewed sense of what I wanted to do. 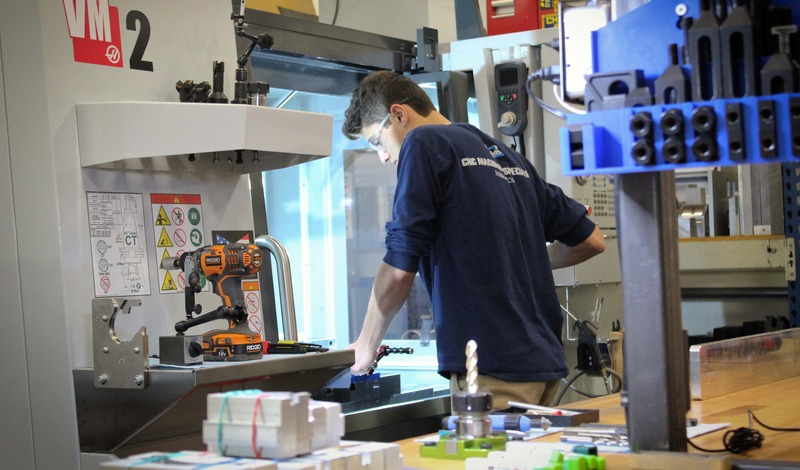 Technical schools are a great way to pick up new skills and advance your career. The manufacturing technology program at the Francis Tuttle Technology Center here in Oklahoma City was great and the instructors there, Dean and Julia, are talented and very patient people. 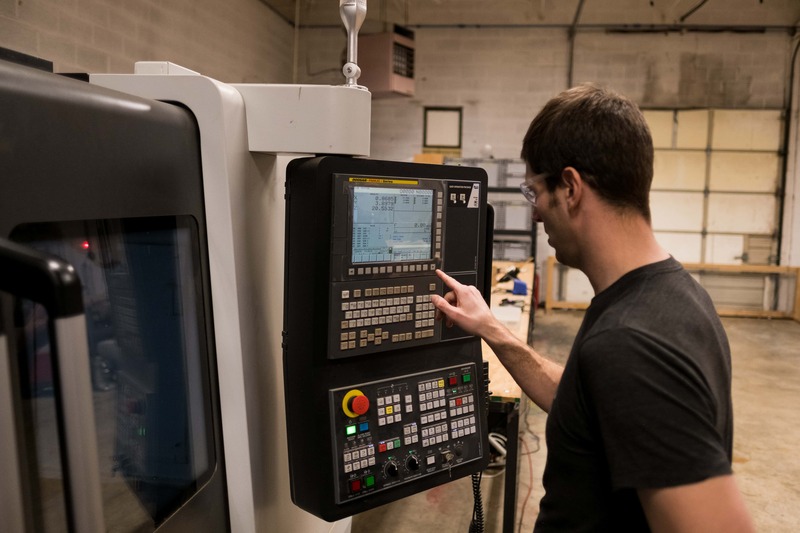 Did your background in writing software help you transition into CNC programming? Absolutely. It was a tremendous help to understand some very strange programming concepts that came with writing software, and it all translated very well into CNC programming. 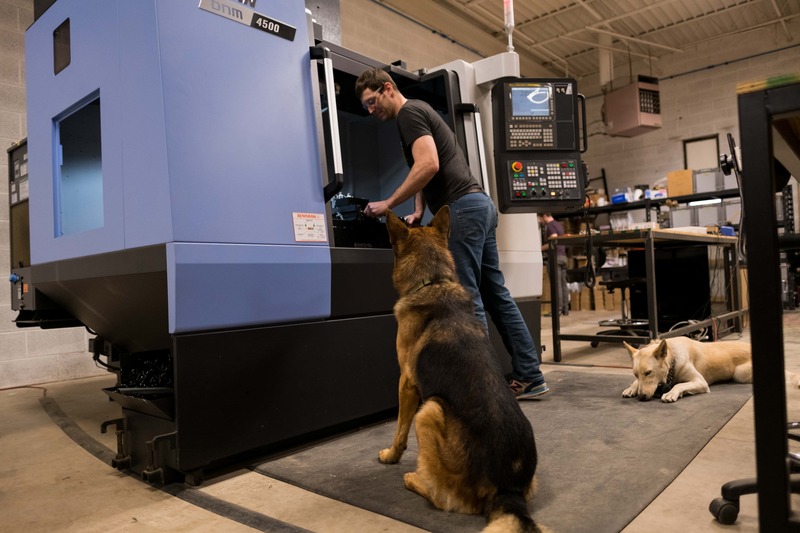 These days, CNC machinists and programmers need to be as knowledgeable about the software and programs as they do the tools and parts, so having a background in software programming or development certainly translates well to the world of CNC machines. Where did the idea to start Okluma stem from? After graduation from the machine shop program, I took a few weeks off and went on a long, off-road motorcycle trip across the country. I had purchased what I thought was a nice flashlight for $50 to carry with me on the trip. However, two days in to the trip the flashlight broke. Of course, it was dark and I was in the middle of nowhere trying to work on my bike. I’m happy to pay for good tools, but that wasn’t what happened. Not only there was no warranty for replacement, there was no way to fix it. It was just made to be thrown away. That whole attitude makes me angry. When I got home, I decided I was going to put my new skills to work and design and build my own flashlight, with the goal of never running into an issue like I had on my trip ever again. I started by making one for myself, then 4, then 20. That was 4 years ago. Now I have my own business with one employee and two dogs, and we stay very busy. What does your current product offering look like? For our products, I currently have two flashlights models (the DC1 and DC2) and we are working on some cool new projects for 2019. With battery and LED technology advancing like it has, there are some interesting applications, way beyond just flashlights, that haven’t been possible until recently. Stay tuned for more information on those by following us on Instagram. The Titanium version of the Okluma DC1 flashlight. 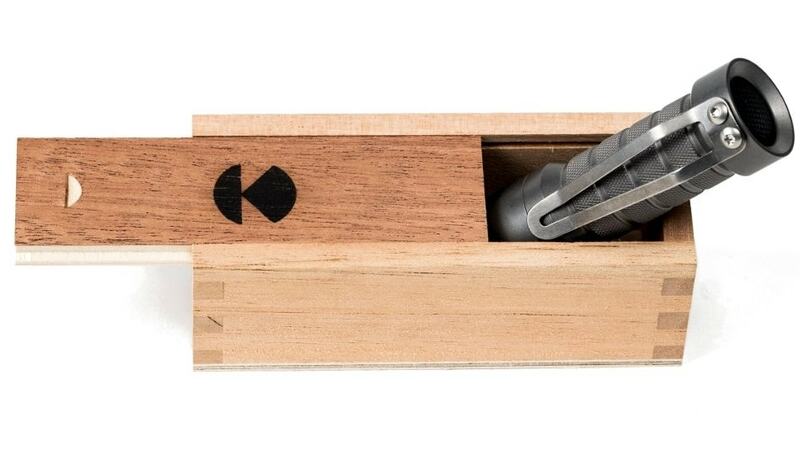 What do you think separates an Okluma flashlight from the competition? 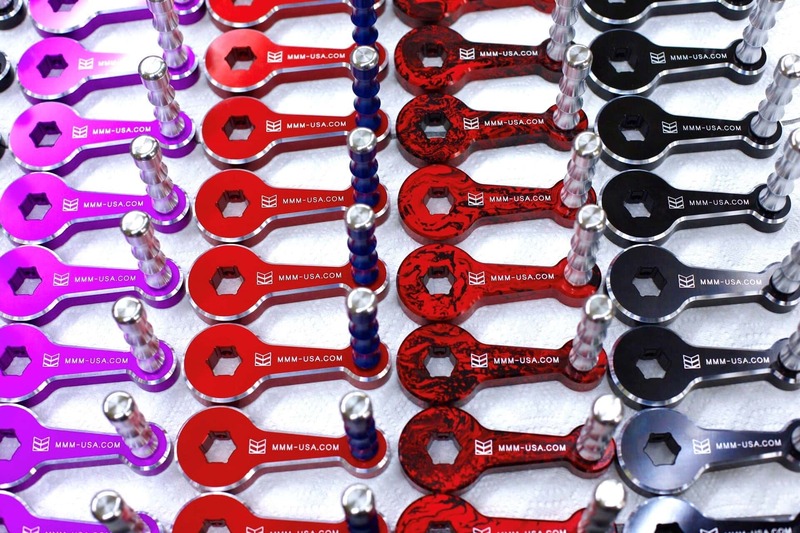 The basic values behind Okluma all stem from me simply wanting a nice tool that won’t break easily and will be supported by the manufacturer. I offer a lifetime warranty and stand firmly behind that. I want an Okluma flashlight to last forever so you will never have to buy another flashlight. The quality and hardiness of a flashlight is important to many outdoors types, homeowners, and collectors, but we also sell lots of our flashlights to the military and police. If their light goes out in a tough situation it could be really bad, so we have to make sure our flashlights can be dependable above all else. Like they always say, you get what you pay for. Our flashlights aren’t going to be the cheapest, but we stand behind them with our warranty and pride ourselves on the quality and reliability. 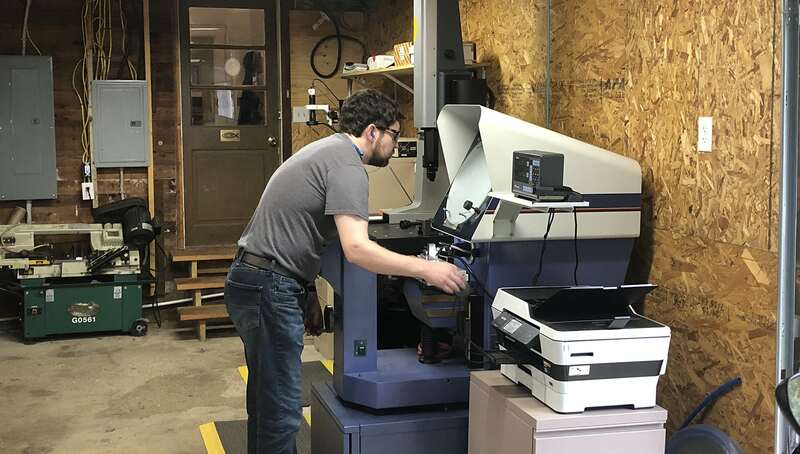 What sort of machines and software do you have in the shop? 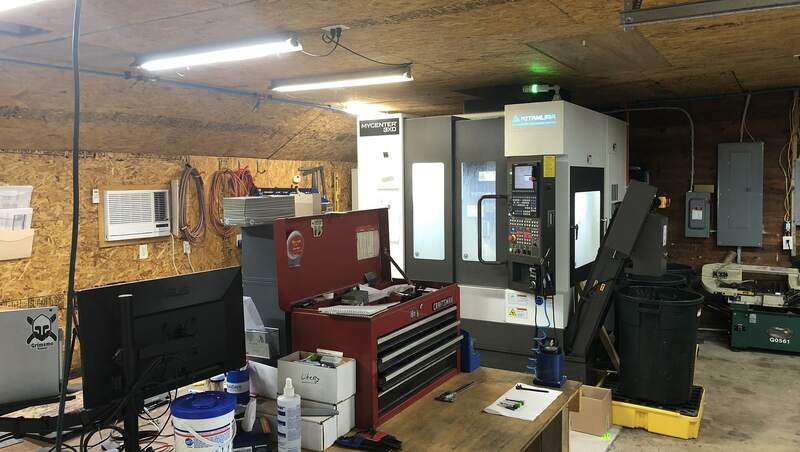 Right now I have the old standards like a Bridgeport mill and an old LeBlond lathe, as well as my CNC machines – a Daewoo Lynx 220LC CNC Lathe and a Doosan DNM 4500 CNC Mill. For software, I use Autodesk Fusion 360 for the mill, and I write the G-code by hand for the lathe. I was more familiar with the lathe, so I had an easier time writing my own code for it. Getting Fusion 360 for my milling has been a huge help. 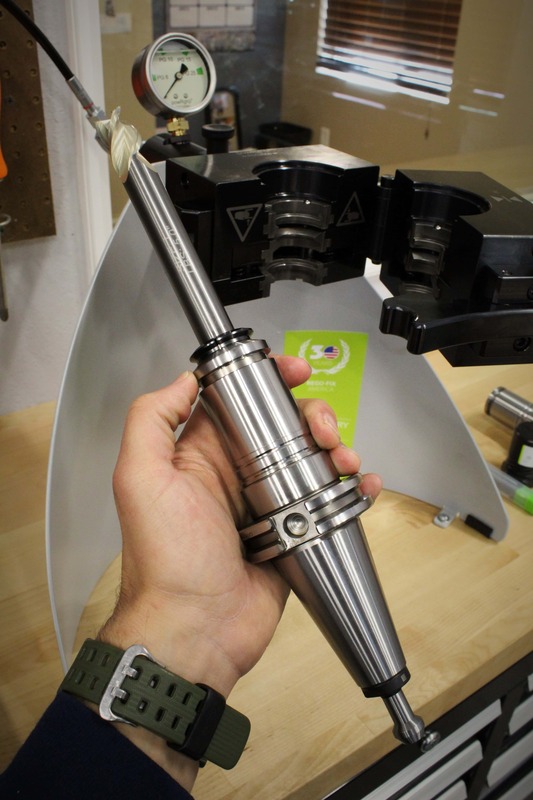 Have you been using the Harvey Tool and Helical Solutions tool libraries in Fusion 360? Yes! The tool library in Fusion 360 was a huge help for me. To be able to get the right tool and not model things incorrectly probably saved me a lot of broken tools. That was a big reason why I came to Harvey Tool and Helical for support in the first place. 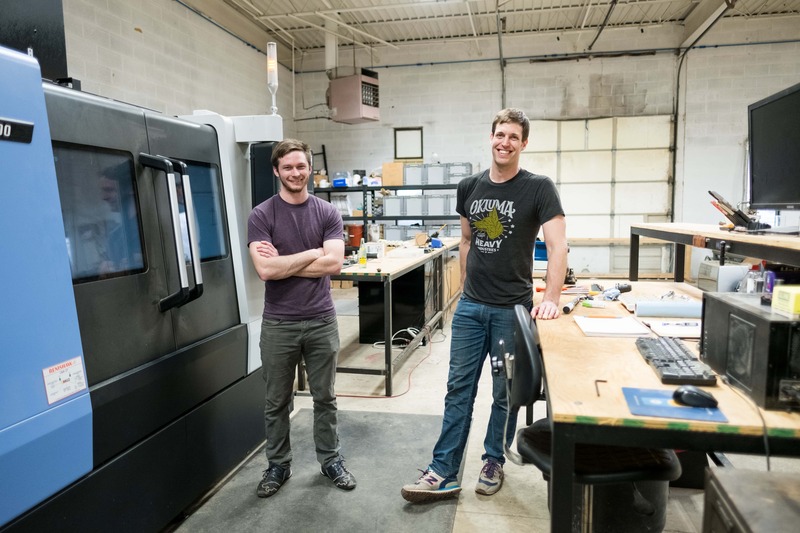 It was cool to come from the software community, where we collaborated on a lot of open-source projects, and see companies like Autodesk opening up their software to manufacturers like Harvey Tool and Helical for these great partnerships. What sort of operations/parts do you create on the lathe versus the mills? As you can imagine (being a cylindrical shaped part) most of the flashlight manufacturing is done on the lathe. For a while I had been making them all by hand, until we got the CNC lathe. While most of the work is done on the lathe, for the more intense pieces we have to drill and tap and do some different slotting operations. We also drill and tap the clip holes for all of the flashlights, so the CNC mill is huge for those operations. As Okluma started to grow, we realized that we had a huge bottleneck doing our secondary operations by hand on the manual milling machine. We solved that problem by buying the Doosan mill to help with secondary operations, but you still have to know how to use it to make it worth the purchase! I was completely in the dark on the CNC milling side of things at that time, as I was much more familiar with the lathe. 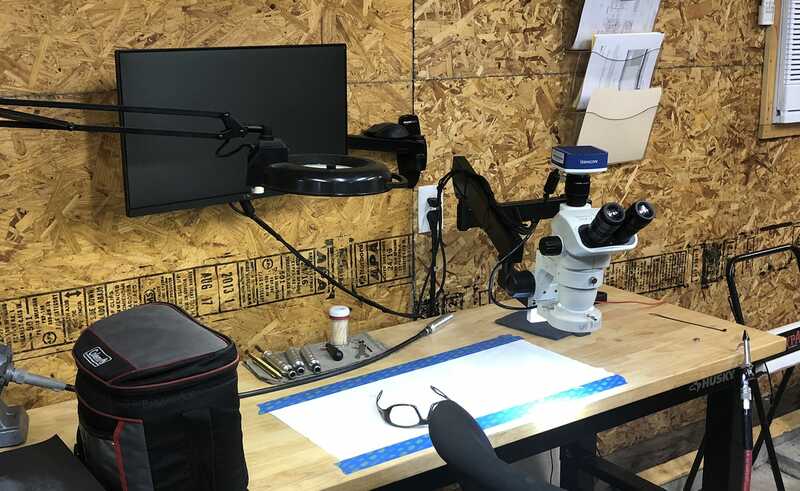 I actually called Harvey Tool with a few questions, and the Harvey Tech team really held my hand and walked me through all of the things I needed to know, which was huge. 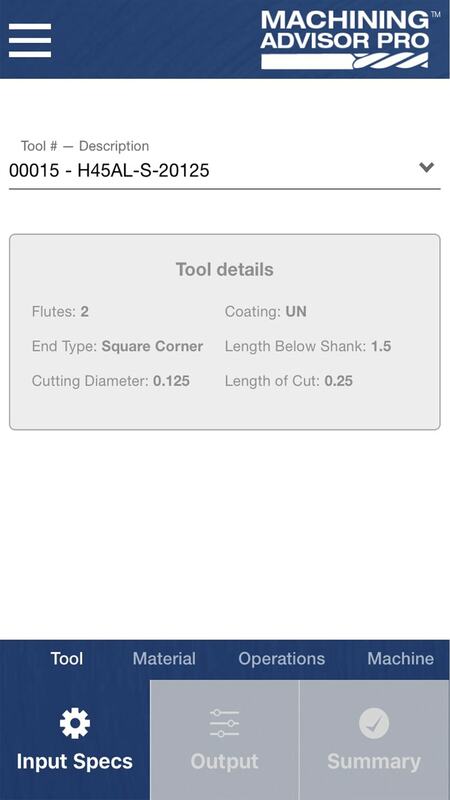 I also used the Machining Advisor Pro application to generate speeds and feeds for my Helical end mills. MAP helped save me a lot of broken end mills and increased my production times. 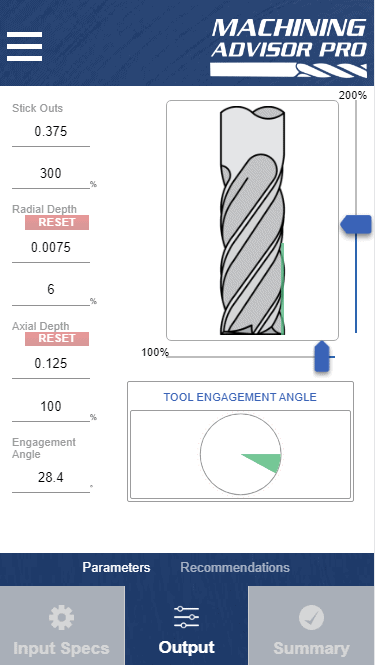 You are using almost exclusively Harvey Tool and Helical for milling operations on your Doosan VMC. 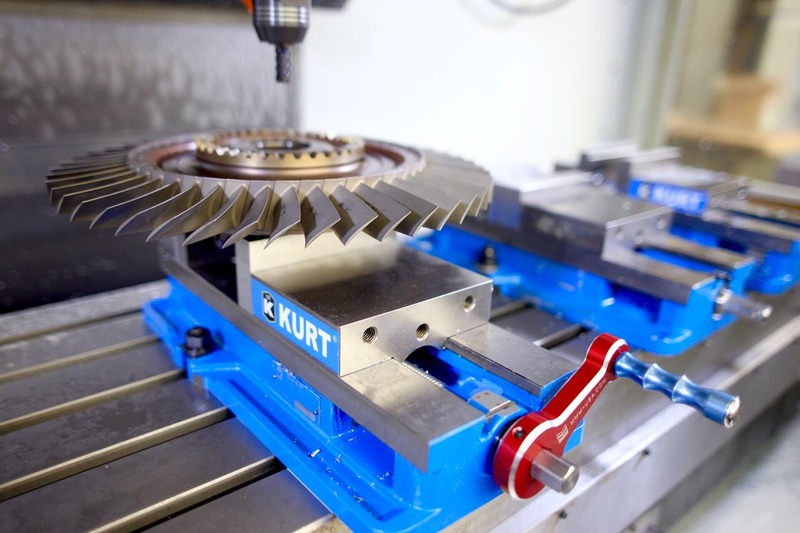 Why is purchasing quality tooling important to you? I can try to do things on my own and eventually get it, but it costs me money on broken tools and it costs me my time, which is even more valuable. 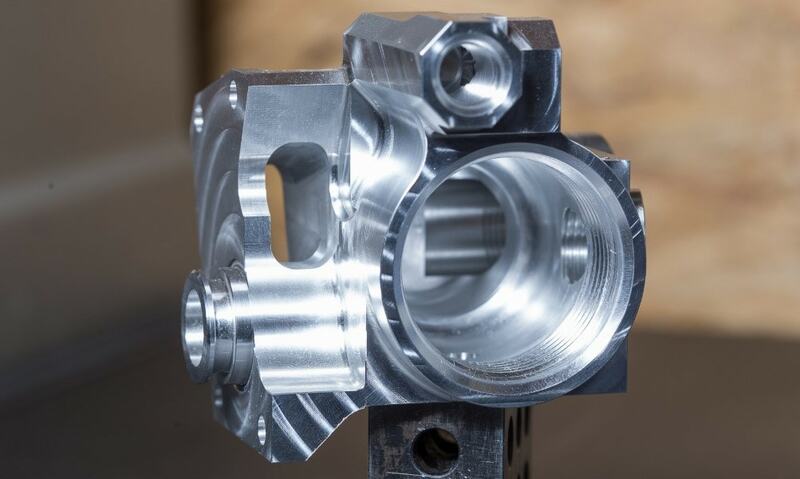 I could go that route with any number of different tooling manufacturers, but the fact that I can call Harvey or Helical and get an answer to my questions the first time, usually in a few minutes, and know it will work is hugely helpful. 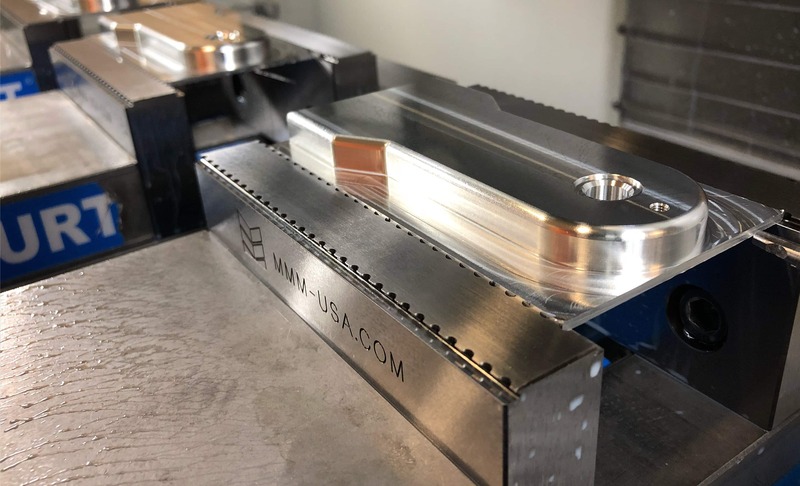 I don’t really look at the cost of the tools so much, because I just know they work and I know I will get the support I need to make my milling operations a success. Can you remember a crucial moment when Harvey Tool or Helical technical support helped you to be more productive? As we try to get more creative with our designs, we plan to rely heavily on Harvey and Helical to explore some of these new applications. We actually build our own tool to work on the flashlights, and we are using Harvey and Helical exclusively to machine that. At first, I was making the tools in two operations; I was doing a radius on top and then flipping the part over to create a radius on the bottom. I was having a hard time lining it up. We moved the second radius on the first operation, and used an undercutting tool and everything matched up perfect. I wasn’t really sure how to do it, but I called you guys and you figured it out with me! We have some cool projects coming up which we are planning to rely on Helical tools for, but people will have to stay tuned for that one! What have been some of your keys to success for your growing sales? Good customer service is key. 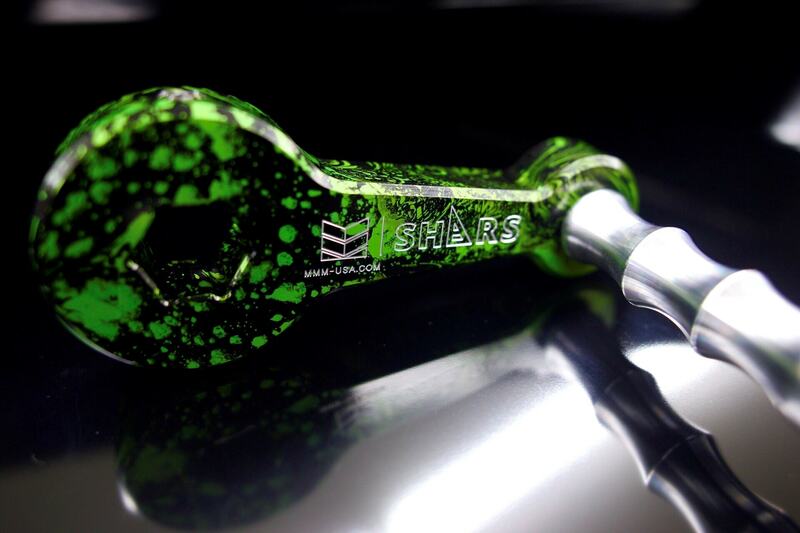 We are one of the few companies that will offer a lifetime warranty. I know there are a lot of flashlight collectors, and we can make fun stuff for those guys, but I want people to really use our flashlights and scratch them and do ridiculous things with them. We have had people use a flashlights in crazy ways (like as a hammer) but we will still fix them under our lifetime warranty. I don’t really care what people do to our flashlights, I just want them to always work. We can also overnight replacement flashlights for professionals who rely on them for work, so they never have to be without one. That is huge for our customers in the military or in law enforcement who rely on our flashlights as an essential tool in their day-to-day lives. Do you have plans to expand into retailers, either online or brick and mortar stores? We only sell direct to consumers right now through our website so that we can control our lifetime warranty. It has worked really well for us so far, so we have no plans to change that right now. I care more about our customers than any retailer is able to. I’ve noticed that you have gathered a rather large social media following. How has social media helped shape your business? A lot of our sales come through Instagram or Facebook, so I would recommend those platforms to anyone who is trying to start a business. We have also had a lot of success collaborating with others in the EDC (Every Day Carry) community where makers are creating knives, wallets, keychains; anything you would carry on you “every day”, hence the name. We have collaborated to make flashlights out of other people’s materials, let other shops refinish our flashlights, and things of that nature. Typically it is something we couldn’t do ourselves, or they couldn’t do themselves, so we share the labor and collaborate on some really cool items. 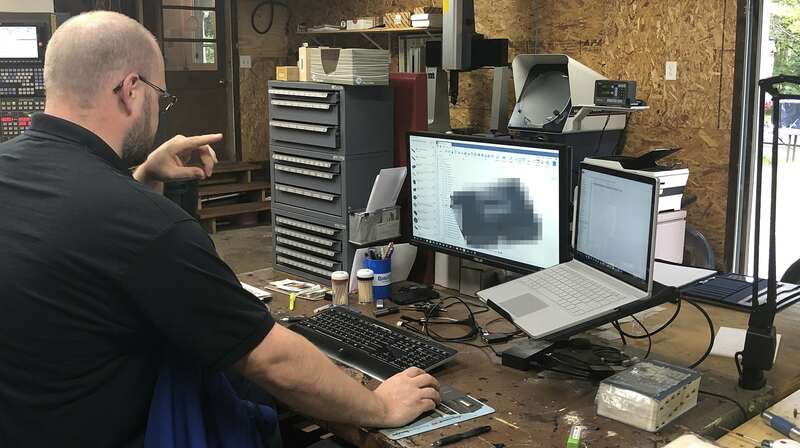 I think social media is especially great for manufacturing because a lot of younger people don’t even know all this crazy cool stuff that is going on in the industry. I was lucky enough to see it first hand at a young age, but so many others never get the chance. It is awesome to share our work and try to inspire some of the younger generation to make their own products and participate in the world of manufacturing. Formula SAE is a student design competition that began in 1980. The competition was founded by the SAE (Society of Automotive Engineers) branch at the University of Texas. Each year, hundreds of universities across the world spend months designing and manufacturing their best Formula style car before putting them to the test in competitions. Alex Marshalek is the Team Captain of the University of Michigan’s Formula SAE team, MRacing. The team was originally founded in 1986, and has been very successful over the years. In the 2017 season, they finished 5th at the Formula SAE Michigan event, and took home a 1st place finish at Formula North. They are hoping to continue riding that momentum into another successful season in 2018. 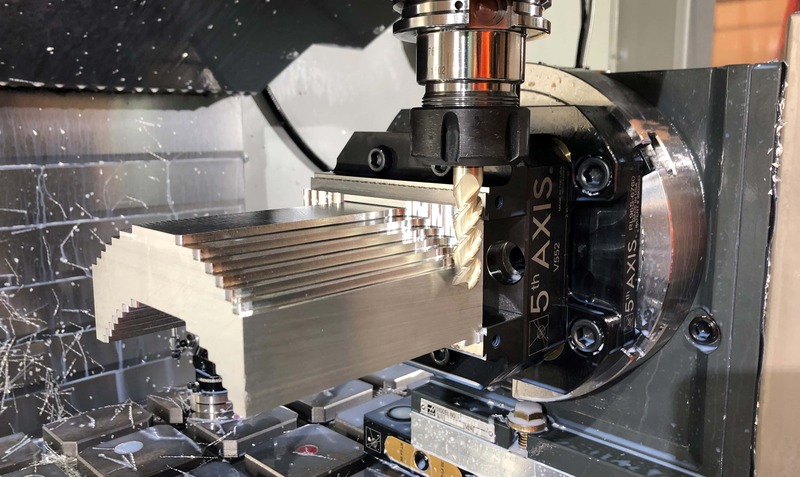 Alex reached out to Harvey Tool and Helical earlier this year, and after some conversation, the decision was made to sponsor their team’s efforts by supplying cutting tools and providing technical support. 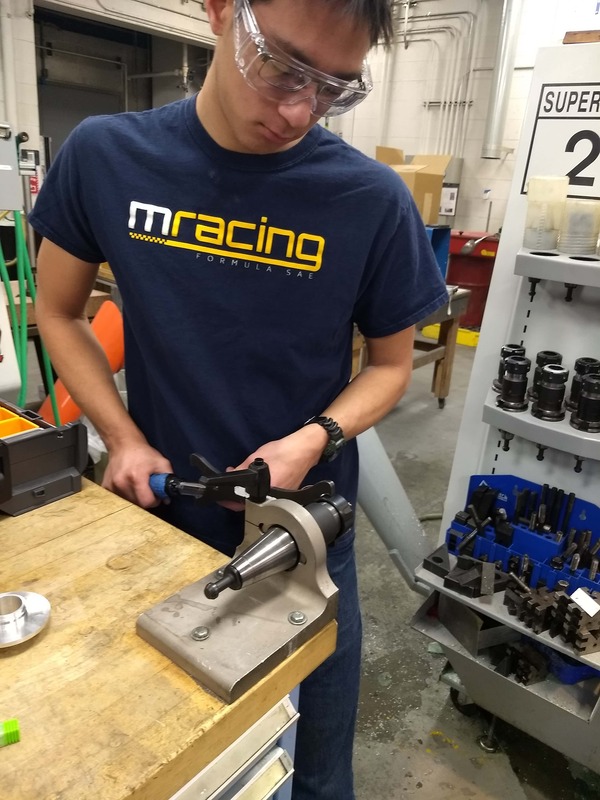 With competitions on the horizon and a new build coming over the summer, Alex was kind enough to find some time to talk with us about his experiences as a student learning the ropes in engineering, manufacturing, and design, the importance of quality tooling and maintaining a superior part finish for competition, and challenges he has faced during this process. Hi Alex. Thanks for taking the time to talk with us today. When you were looking into college degree programs, what initially interested you in manufacturing and engineering? I have always had an interest in Aerospace Engineering, but it was nothing more than a personal interest until I started college. My high school unfortunately did not have any machine shop or manufacturing type classes, so a lot of what I knew, I learned from my dad. My dad worked as a Mechanical Engineer at an axle manufacturing company, and he used to always be doing things around the house and showing me the basics of engineering and design. When it came time to choose a school, I knew that Michigan had an impressive Aerospace Engineering department, and I liked the feel of the campus and community better than other schools I had toured. How did you first get involved with the Formula SAE team? I knew going into school that I wanted to get involved in a design team and advance my learning in that way. 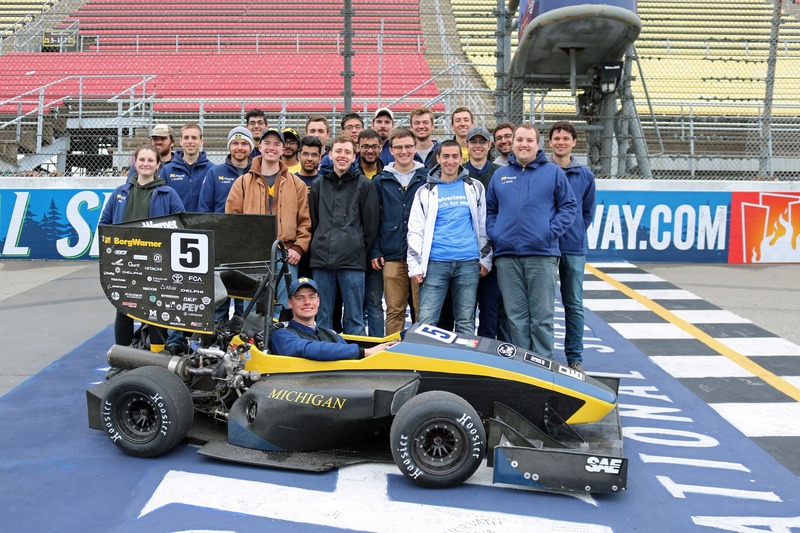 We have about a dozen different design teams at Michigan, but the Formula SAE team really stood out to me as a really cool project to get involved in. I started with the team in Fall of 2016, helping out with the design and manufacturing of the vehicle’s suspension. Now, for the upcoming 2018 season, I am taking over the role of Team Captain. There will be a little bit less hands-on design and manufacturing work for me as it is more of an administrative/outreach role. 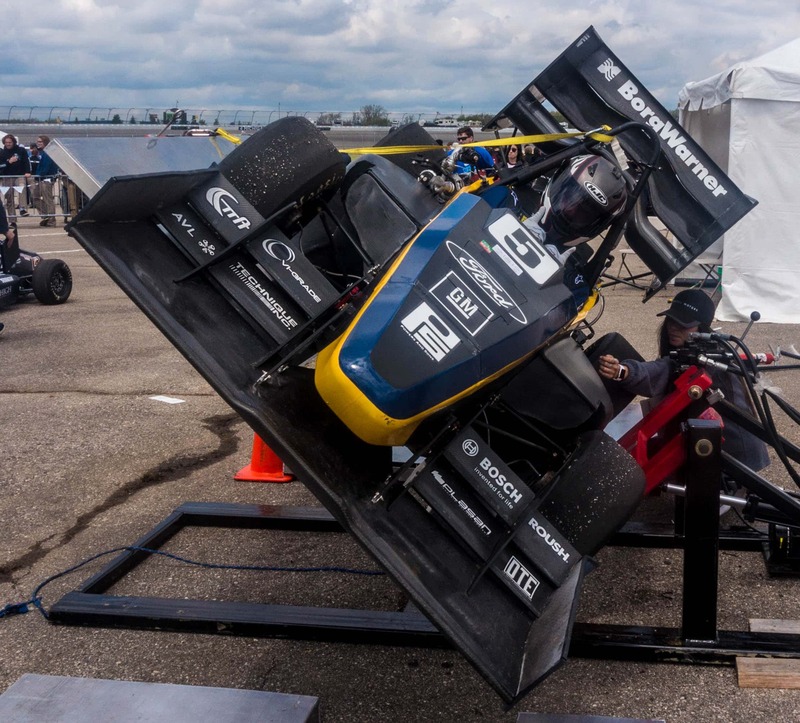 How does a typical FSAE season run? So FSAE seasons are constantly running, and nearly overlapping with each other. For example, we are currently finishing up competitions from the 2018 season, but at the same time we are beginning the design of the vehicle for the 2019 season. Typically, the design work is done over the summer, and finalized in October. After that, the major manufacturing begins and lasts until about March, with spare parts and additions being added as we go. Testing begins in March, where we fine tune the vehicle and optimize the design for performance. Then, the rest of the Spring and early Summer is competition time, and the process starts all over again! What sort of machines do you have in the shop? 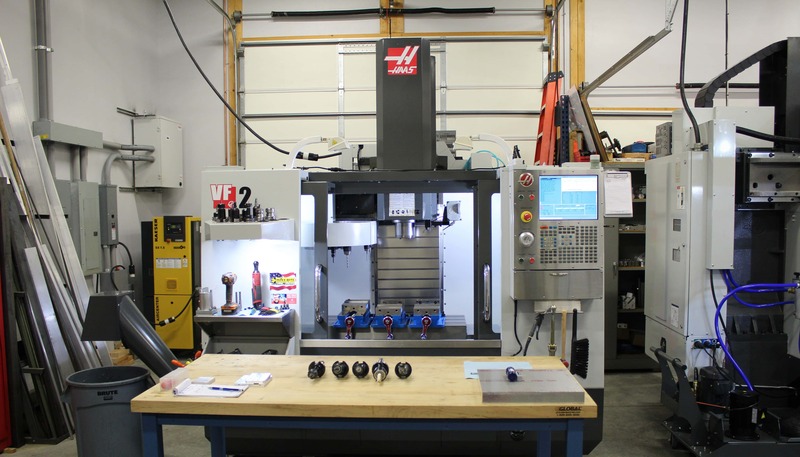 Right now, we have three manual Bridgeport mills, two retro-fit CNC Bridgeport mills, 2 manual lathes, 1 retro-fit CNC lathe, and a Haas VF-2SS and Haas SL-20. For the vast majority of what we are machining, we are using the Haas. We do most of our work in Aluminum, with some parts made out of steel or titanium, and the Haas has been great for everything. 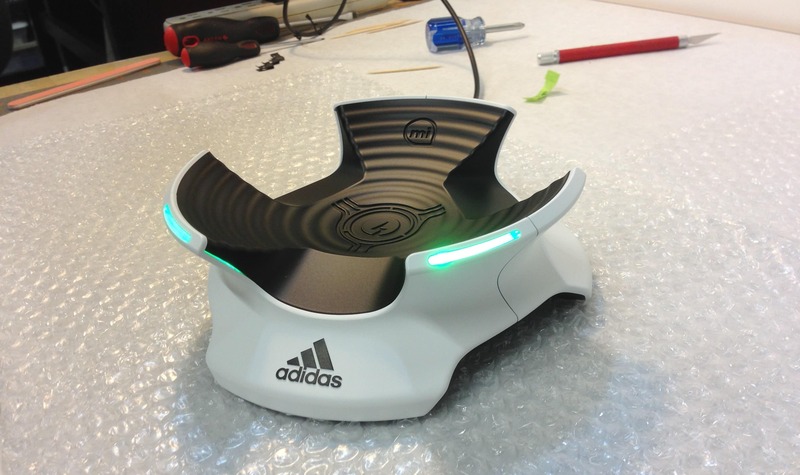 We are also using AutoDesk’s Fusion 360 software for our CAD/CAM, and we love it. What has been the most difficult part of the build? Time is really the biggest challenge. 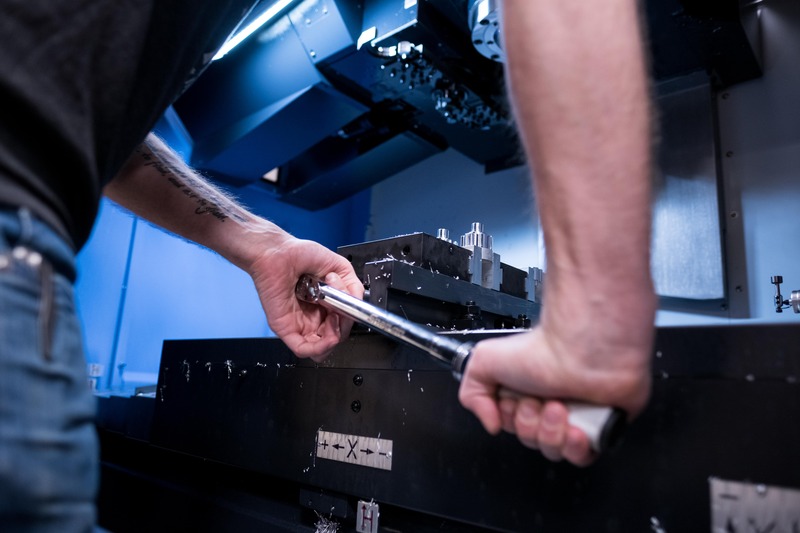 We are all full-time students, so time is already hard to find, but we also don’t have an overabundance of machinists so the operators can get overburdened. It all works out in the end and our machinists are great, but time management is truly the biggest challenge. 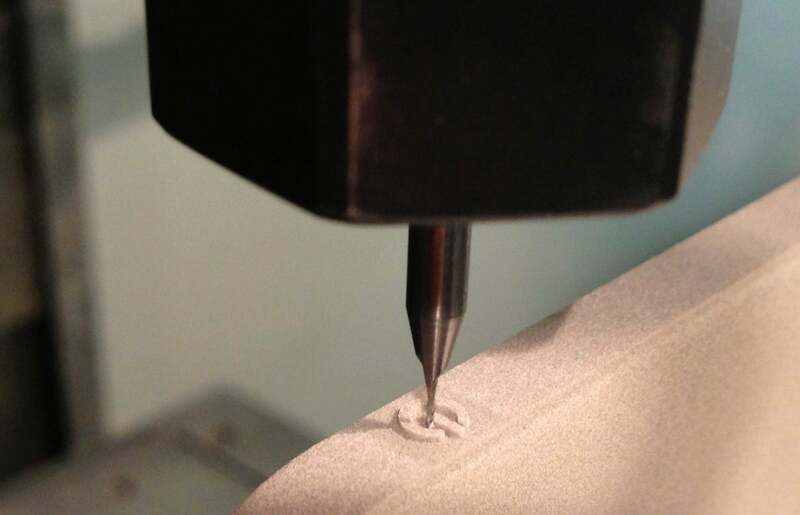 The composite materials we work with are also very challenging to machine. We constructed the vehicle’s monocoque (the structural “skin”, often seen in Formula One cars) out of carbon fiber. 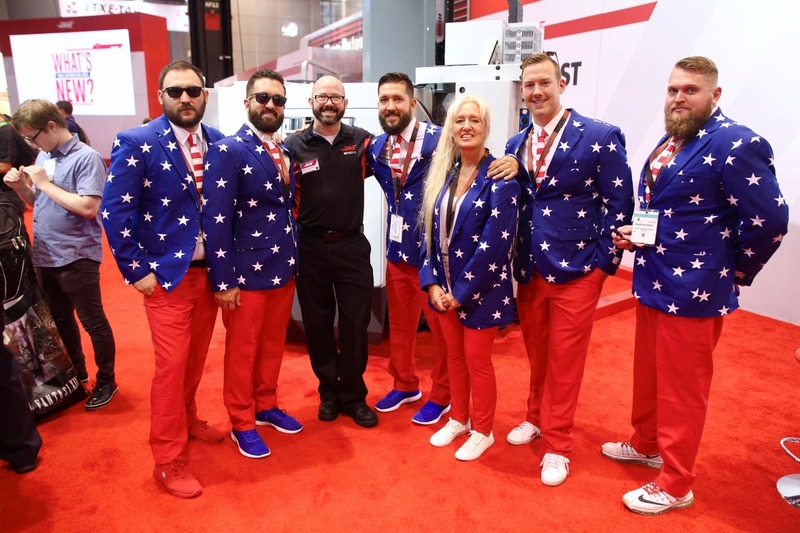 While we cut a lot of it on the water jet machine, we needed more precise holes than a water jet could offer, so we went to the Haas for that. We were using HSS drills and only getting 10-12 holes at a time before they wore out. However, we had Don Grandt (Harvey Performance Company Application Engineer) stop in the shop and he sent us a few Harvey Tool diamond coated drills, which should make this a much faster and more precise process! You mentioned Don stopped in to give you guys a visit. What were some of your biggest takeaways? Don was great. He stopped by and we gave him a tour of the facility and showed off some of the parts we were designing. 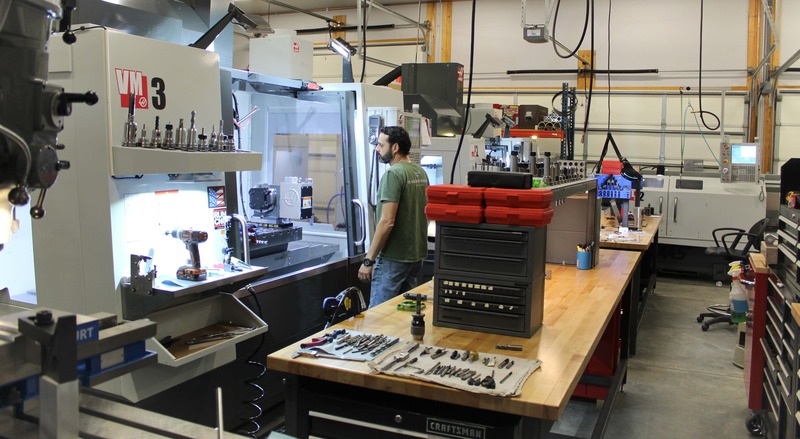 We talked shop for quite a bit, and he gave us a bunch of great tips and tricks we could use to really optimize our machining. As I mentioned, he also went through the catalogs with us and helped us find exactly what we need for tooling. 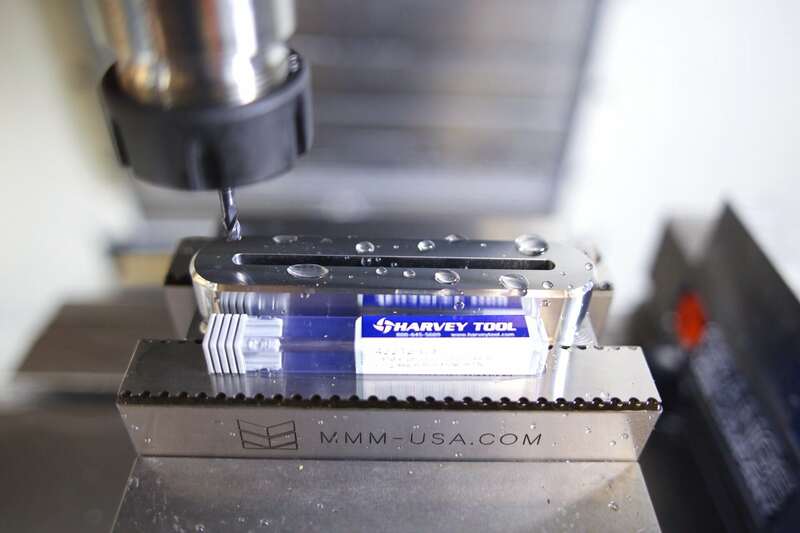 The Harvey Tool diamond coated drills are going to be a life saver for carbon fiber. 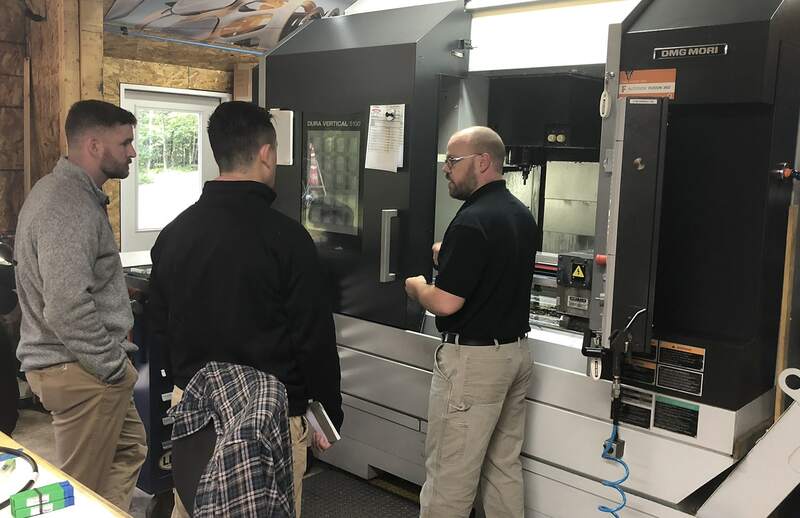 I guess the biggest takeaway was just all of the knowledge we received from Don and how helpful that was to have someone direct from the tooling manufacturer sharing everything we knew with us. 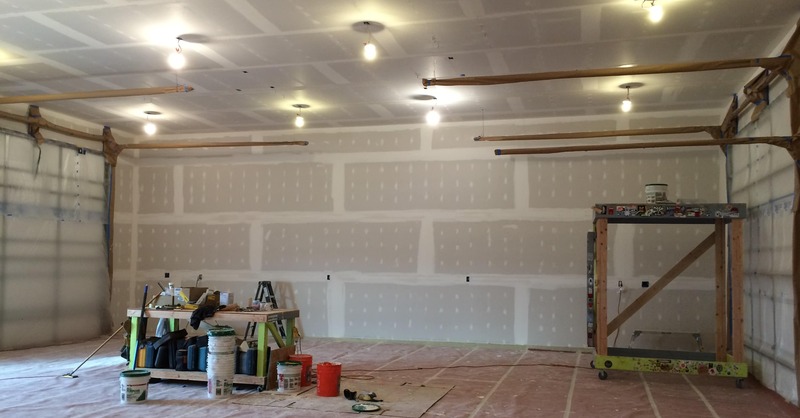 Now that you have the Harvey and Helical tools in the shop, how have they helped you complete this project and get a leg up on your competition? One of the most impressive things for us have been the finishing end mills we received. The Helical finishers for Aluminum are giving us some of the best finishes we have ever seen. For us, that is a point of pride. 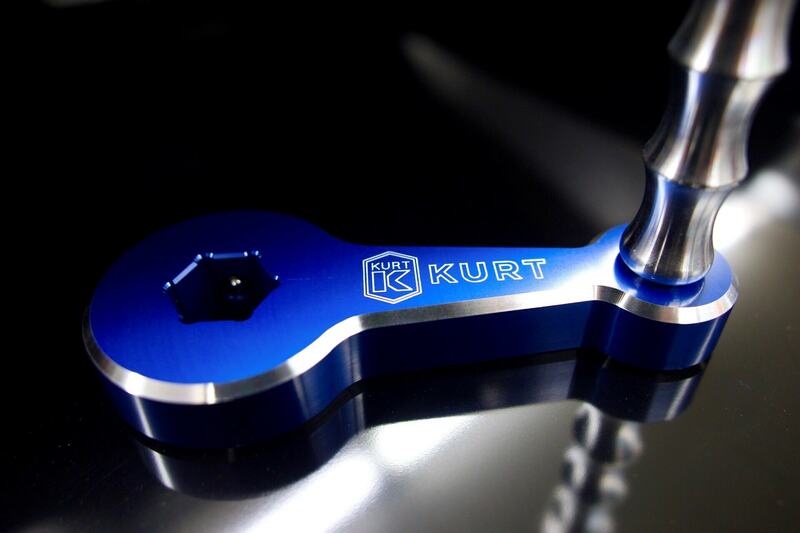 We not only want to have the fastest and most well-designed vehicle, but we also want to have the best looking parts. Subpar finishes reflect poorly on the entire build, and first impressions mean a lot in these competitions. We have also been blown away by the Chipbreaker roughers. We absolutely love those tools and push them to the limits with great results. In fact, the first time we ran them, we used Machining Advisor Pro to dial in our speeds and feeds, and the numbers seemed insane to us. We were nervous, but we pushed the button and let it run. It was amazing to see that we could push a tool that fast without tool failure. 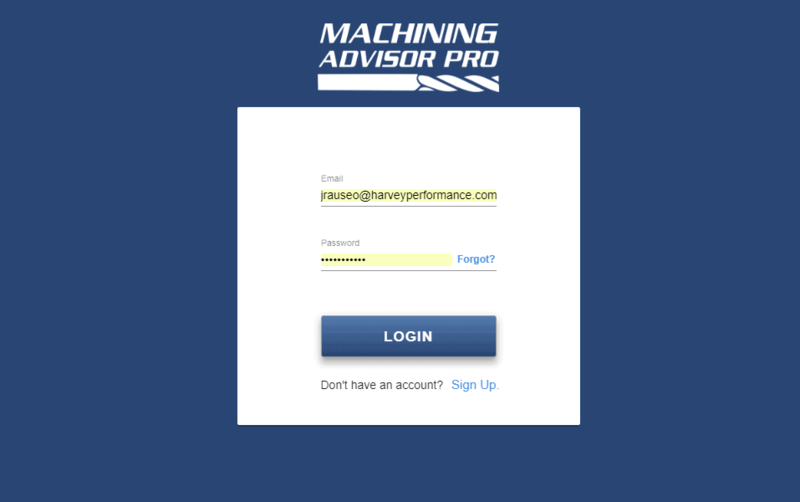 How has your experience been using Machining Advisor Pro? 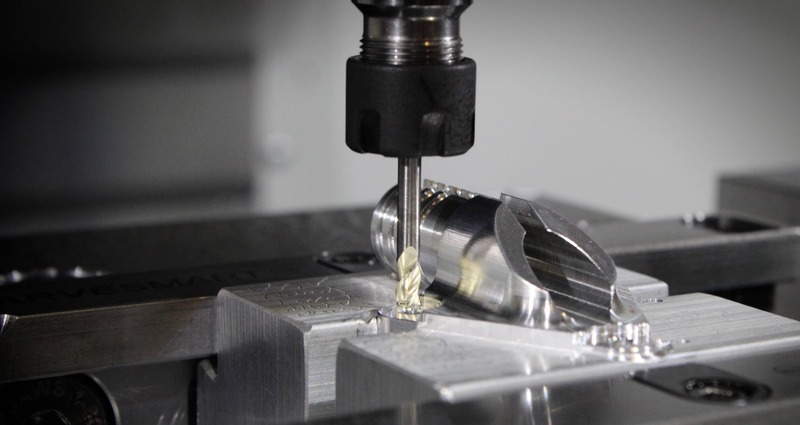 We use Machining Advisor Pro every time we picked up the Helical end mills. MAP was actually one of the main reasons we were looking for Helical to sponsor us. 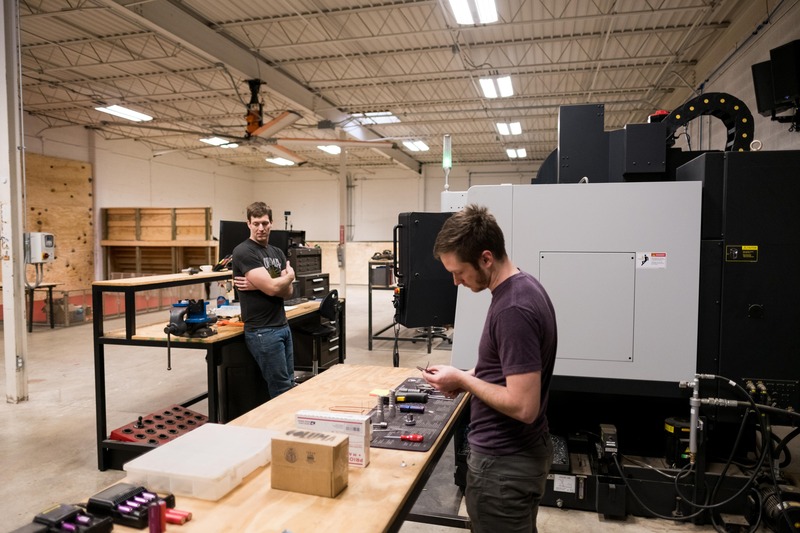 We had heard a lot about MAP and your level of technical support, which was important to us as we are learning more about manufacturing and machining. 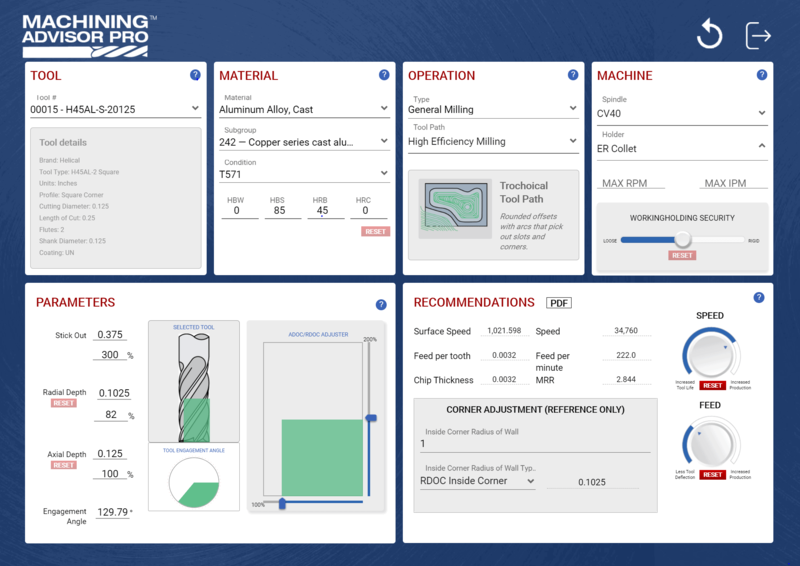 Machining Advisor Pro has quickly become one of our best learning tools in the shop. The nice thing about MAP is that is takes a look at all of the parameters. A lot of applications only give you numbers on your speeds and feeds, but MAP takes a look at the depth of cut, chip thinning, engagement angle, and all of the other parameters that are so essential to a successful run. 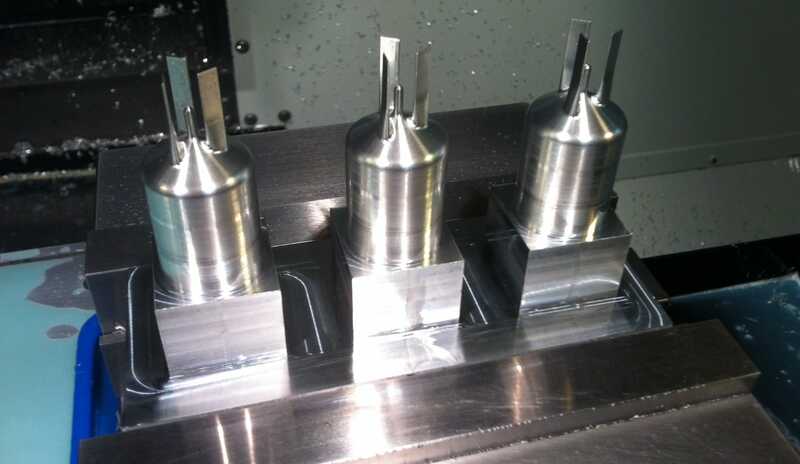 As a result, we have been able to get very aggressive with the end mills. We are not a huge production shop, so cycle times are not as important, but we still want to get the most out of our tools in the least amount of possible time. So, let’s break down some specs. What are you all working with on this year’s build? Right now our car features a 4 cylinder Honda 600 CBR engine, with a Turbo and 600cc displacement. We are one of the few teams that run a turbo in competition. As we mentioned, the monocoque is completely carbon fiber, and the car features a full aero package with an undertray. The max speed is around 80 MPH, and the car weighs 420 pounds without the driver. Once the build is complete, how does a typical competition work? Most of the Formula SAE competitions are multi-day events, with a few static events, and then dynamic events where the car is running. For static events, we first have a Design portion. We validate and argue for our design in front of judges who are engineers in the industry. Then, we get into a Cost presentation, as one of the goals is to build the cheapest possible car with a high level of performance. 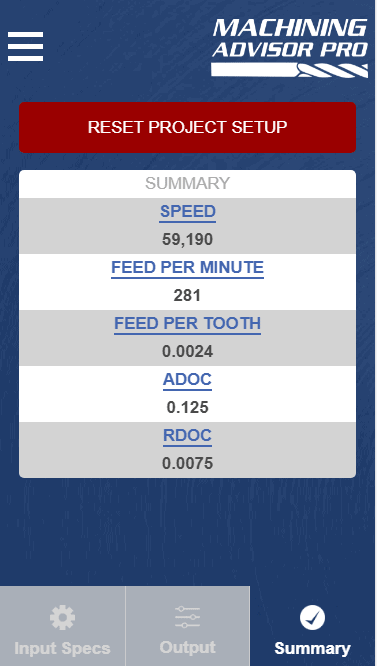 That balance of cost vs. performance is a critical part of the build. 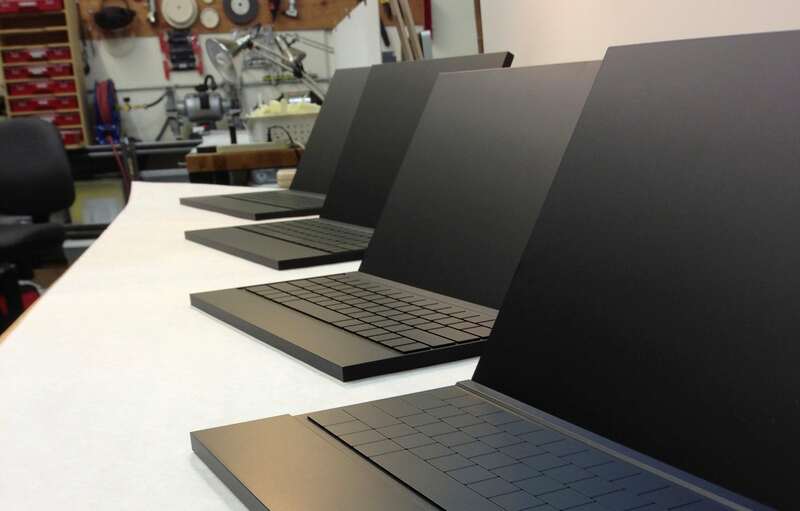 The last static event is a Business presentation, where we introduce a business/manufacturing plan on how to get this design to a production level of 100 units in a year. For the dynamic events, we have 4 different tests. First, we have the Accel Run, which is a 75 meter sprint, and the fastest cars win. From there we go to the Skip Pad event, which is centered on turning radius and the stiffness of the chassis as we do tight figure eight turns with the car. Then we have the AutoCross, a one lap race, which determines our placement in the final event; Endurance. For the Endurance event, we drive the cars around a 22km track, and the goal is to finish the race without any mechanical or design failures in the quickest time possible. Only around 50% of participants actually complete this event. If a single part falls off, or breaks, you are disqualified. Many times we see things like the suspension, powertrain, or wings falling off. It is disappointing when it happens, but it allows us to easily identify any flaws and fix them for the next event. What is next for you after school? Any future plans or goals? I am currently majoring in Aerospace Engineering, and would like to stay within that industry. I am leaning towards working on aircraft. Designing either aircraft structures or the aerodynamics would be very cool. I really like the size and scale of working on commercial aircraft, but I could see myself doing something more specialty like working in Defense as well. Alex and his team had a very successful 2018 season. They recently placed 9th overall in a competition at the Michigan International Speedway. In the dynamic events, they placed 4th in Skidpad, and 7th in Autocross. The high placement in the Autocross event allowed them to race head to head against top teams in the world, and they ended up placing 4th in Endurance out of 104 cars! 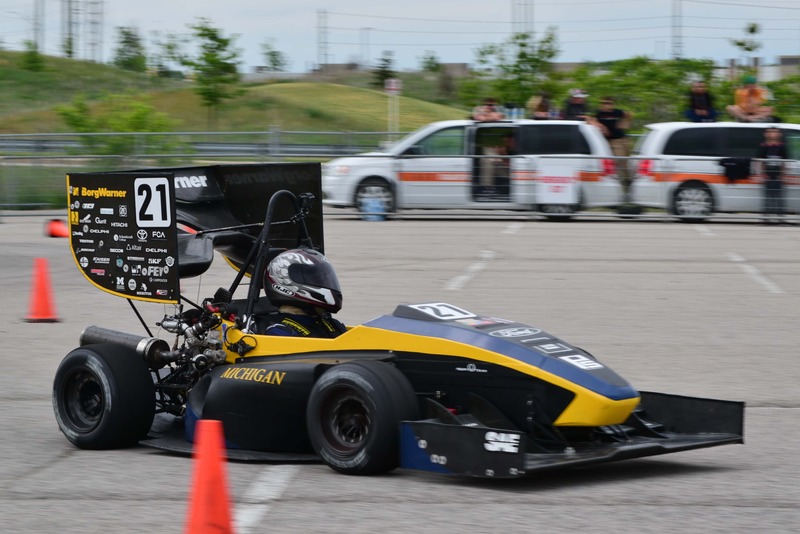 The MRacing team also competed at Formula North, a competition in Ontario, Canada, where they achieved a top ranking of 2nd place overall. They passed all of the technical inspections on the first try and placed 1st in Acceleration, 2nd in Skidpad and Endurance, 3rd in Autocross, and 4th in Efficiency. 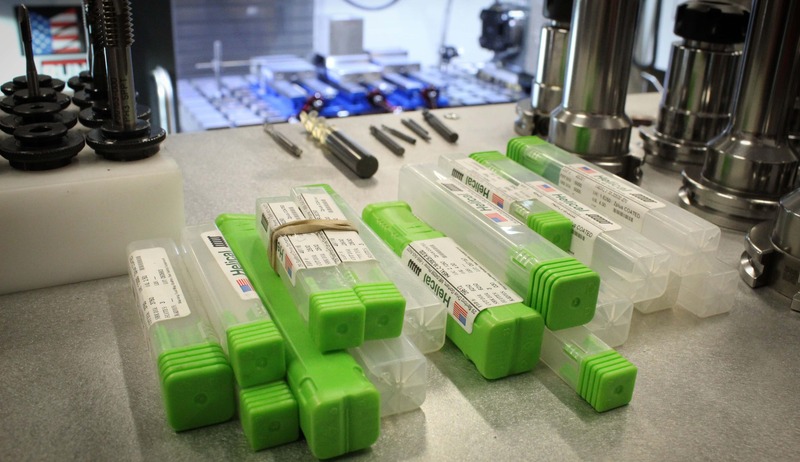 Many of our end users have had great questions about our manufacturing process, how we keep all of our tools in stock, and more. 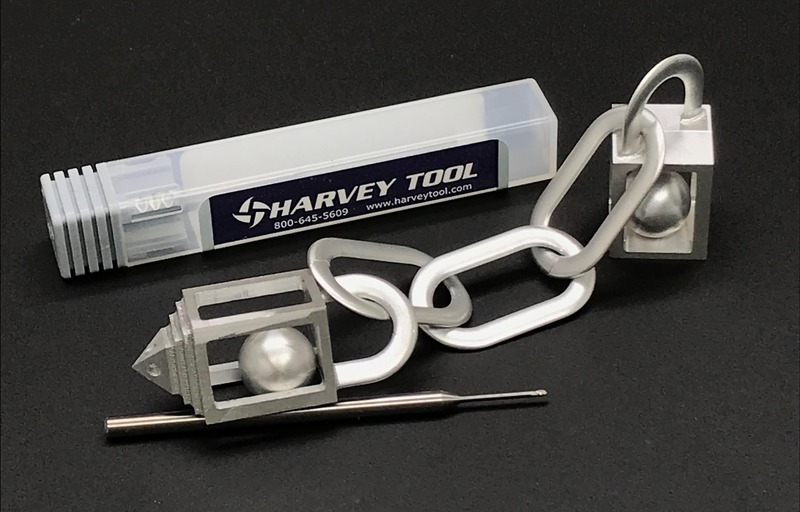 Now for the first time, we decided to open our doors and show you how we manufacture and fulfill the Harvey Tool product. We partnered with John Saunders from NYC CNC to create a “Factory Tour” video, covering topics like our CNC grinding machines and setups, tool manufacturing, and our warehouse organization and fulfillment procedures. In the video below, we first toured our Rowley, MA warehouse and fulfillment center with Fulfillment Manager Megan Townsley. After that, we head up to Maine to check out how the Harvey Tool product is manufactured and inspected with VP of Operations Brian McKahan. We know you’re busy making amazing parts, and might not have time for the entire video. 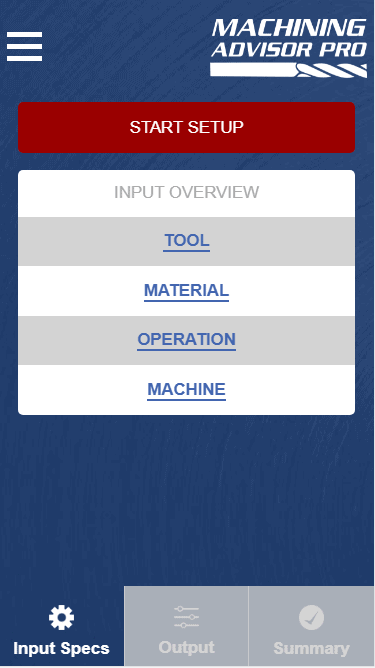 To save you time, here are some of the highlights and facts you should know about Harvey Tool. Our miniature end mills are in stock in diameters down to .001″. 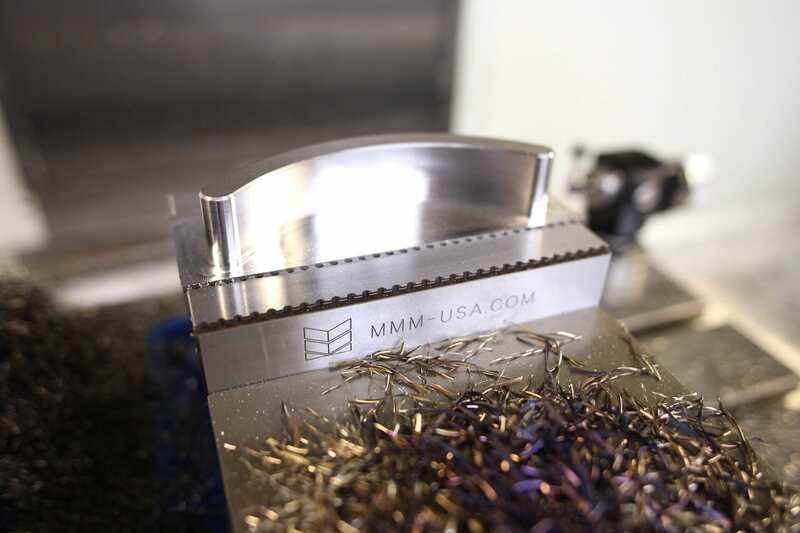 In fact, our Stub and Standard end mills cover every diameter from .001″ to .120″, meaning we will always have you covered when it comes to micro-machining. 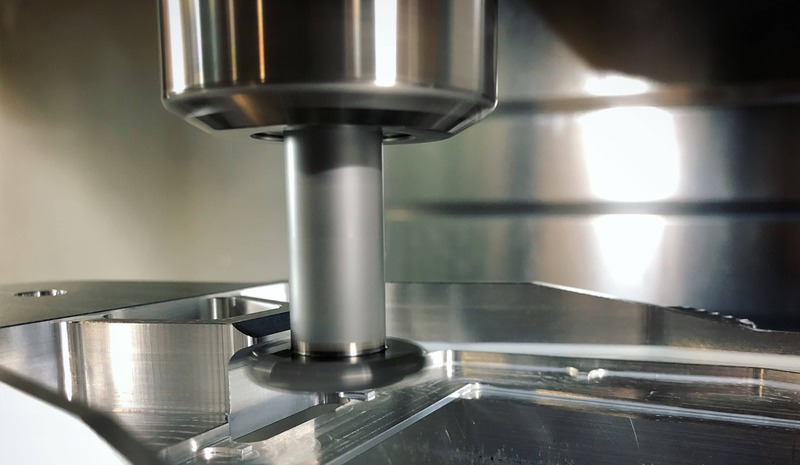 Although it is hard to see with the naked eye, you can get an up-close look at the famed .001″ end mill by jumping to the 35 minute mark in the tour video. 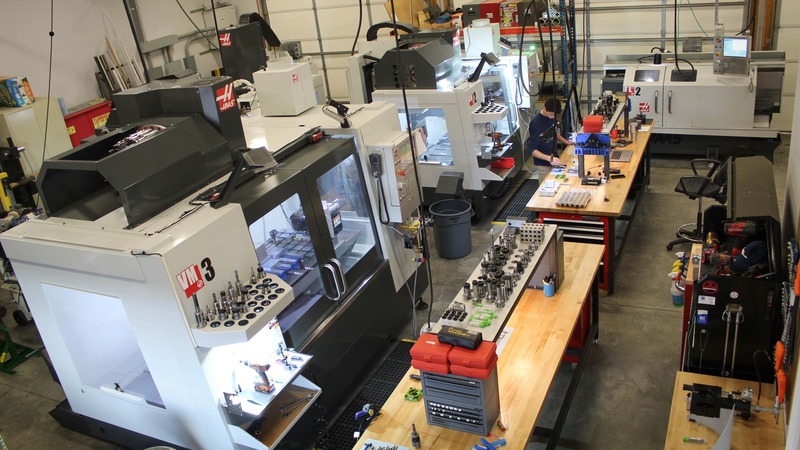 We utilize advanced CNC grinding technology to manufacture our miniature tools at our plant in Maine. Brian MacKahan, VP of Operations, does an excellent job of breaking down our manufacturing process beginning at the 21 minute mark of the tour video. If you just want to see some miniature CNC grinding in action, jump ahead to the 26 minute mark. All of our tools are sent through an extensive inspection process, both at our plant in Maine and at our headquarters in Massachusetts. 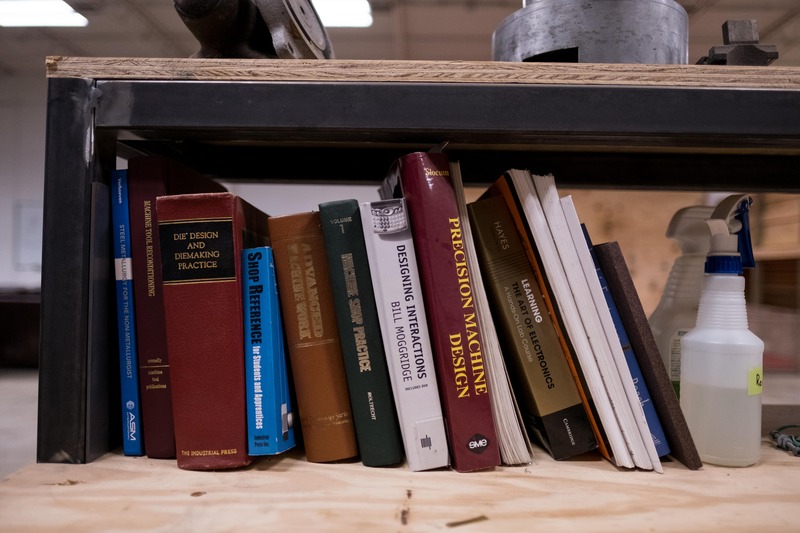 To check out the Massachusetts inspection room, head to the 19 minute mark of the video. If you want to see some more in-depth inspection at our facility in Maine, you can jump to the 35 minute mark. If you need it, we have it. All 20,000+ tools from our catalog are kept stocked and ready to ship to you the same day. If you need more proof, jump to 15:30 in the tour video, where you will see John Saunders choose a randomly selected Undercutting End Mill from our catalog and find it in our warehouse, in stock and ready to head out to a shop. Our fulfillment team handles all of your orders with precision and accuracy. We maintain a 99.8% order accuracy rate, with fulfillment team members checking every order multiple times to ensure you receive exactly what you need. You can learn more about our order fulfillment process and accuracy rates by moving to the 5 minute mark in the video. Miniature end mills have always been our bread and butter, but did you know that we have many larger diameter tools in stock as well? At the 9 minute mark in the video, you can see John pull out a 3/4″ Long Reach Ball Nose End Mill from our shelves. 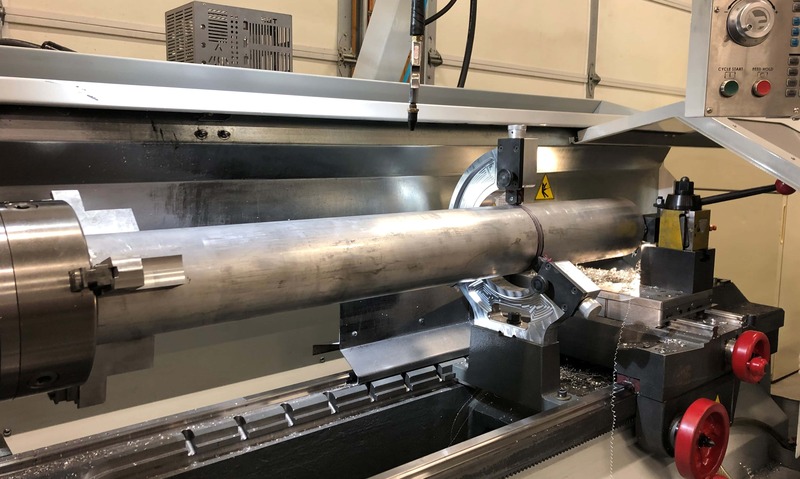 If you are interested in larger diameter specialty tooling, jump to 12:15 in the video to check out one of our large diameter Corner Rounding End Mills. Though we didn’t catch it on tape, John Saunders was blown away by our tech team during his visit. He got a chance to pick their brains about a problem he was having and a few minutes later, he received a recommendation for the right compression cutter to tackle his unique operation. This tool was later showcased in one of his “Widget Wednesday” videos. When you choose Harvey Tool, you will never get an automated system or countless steps before you are able to talk to a real person about your applications. Our industry-leading technical support team is available over the phones or via email every Monday-Friday from 8 AM EST to 7 PM EST. You can reach them by calling 800-645-5609, or by sending an email to harveytech@harveyperformance.com. We value our large distributor network, and we ask that all orders are placed with your local dealer. To find the closest distributor to you, use the “Find a Distributor” tool on our website. We are currently hiring for many different positions, including open CNC Machinists positions for all shifts at our manufacturing plant. If you want to be a part of the Harvey Performance Company team, check out our Opportunities page for more information.